A LEGO Star Wars set is the perfect present for a Star Wars fan of any age. There are loads of different options available – just about everything from the Star Wars movies can be found in LEGO form. LEGO is a great activity for children of all ages – it is great for developing problem-solving skills and manual dexterity. It’s also great for promoting imaginative and creative play. A Star Wars-themed LEGO set is particularly ideal for those who love the movies – kids will love to come up with their own scenarios and adventures with their new toys. LEGO is a great gift for children, as it can be added to over the years allowing kids to build up a great collection. They will love saving up to buy the latest kits, and it makes shopping for Christmas and birthday toys a whole lot easier! Age is the main thing you should think about when choosing a LEGO set for your child. Every set shows on the box the recommended age range the set will be appropriate for. Whilst this is a guide, and many children will enjoy sets outside the range, they are a great guide for parents. More challenging sets can be a great way for children and parents to spend quality time together working it out. LEGO pieces can be dangerous for young children. It is not recommended to allow children under the age of 3 to play with LEGO as it can be a choking hazard. Therefore, if you have older children as well as a baby or toddler, it’s best to make sure they safely pack everything away when they are finished playing. There is a huge range of sets available in this range, so it’s wise to choose one which features your child’s favorite characters. LEGO sets are great for imaginative play, so your child will love to make characters interact, or let them drive their vehicles. These sets are ideal for both playing with and displaying. If your child wishes to display their models, it’s a good idea to get a stand or a cabinet to keep the models safe. Children can also glue models together if they’re sure they don’t want to take them apart to build again. This can also be a great activity for parents to help out with. This LEGO set comes with 6 mini figures to create a range of scenes. The figures are realistic and detailed, sure to be loved by fans of the movies. There are various weapons for the mini figures to use to defend themselves in battle, too! This LEGO is great for older children – it has over 1000 pieces and is highly detailed. The LEGO Force Awakens spaceship has lots of features just like in the movies, making it great for enacting favorite scenes. There are laser turrets and spring-loaded shooters which really fire. There’s also a secret compartment to hide equipment and figures, as well as a removable cockpit which seats two minifigures. 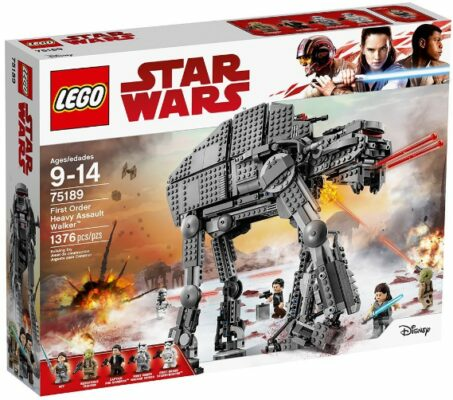 This large LEGO set is sure to be loved by older kids who love The Force Awakens and will also be popular with parents who are fans of the series. This Clone Wars LEGO set includes two popular characters in minifigure form – Yoda and R2-D2. It even includes lightsabers so your child can create their own adventures. The cockpit opens up so Yoda can pilot his ship, with space for R2-D2 to join him. The Disney LEGO set is recommended for ages 8-12 years old and includes over 250 pieces. The ship features folding wings as well as laser cannons and spring-loaded shooters. There’s also extra ammo for the shooters, to use during battles! This Rogue One LEGO set is ideal for older children, aged between 8-14 years old. The Walker features posable legs and a turning top section, making it great for interactive play. It also comes with front guns and spring-loaded shooters like many other Star Wars LEGO sets. The set comes with 3 minifigures. The cockpit and top hatch open, allowing a figure to be placed inside. The cockpit features a great level of detail, allowing your child to really become immersed in their play. Each figure comes with several pieces and some weapons, allowing children to replicate a variety of scenes from their favorite movie. This Disney LEGO toy is best suited to children between 8-14 years old, and features almost 700 pieces. It also comes with 5 minifigures, as well as several weapons for them to use. One of the characters even comes with a backpack which can be built up to make a blaster for him to use. The Starfighter comes with many moving parts, including retracting the landing gear, for playing in the air or on the ground! It also features a movable crane, for even more dynamic play. The original Star Wars Trilogy Starfighter is great for going into battle with other LEGO sets – there are plenty of weapons with this spaceship! There is a wheel to turn which opens a hatch to drop bombs. There’s also a rotating ion cannon to fire in all directions. This starship from The Force Awakens is ideal for older kids and young teenagers. It has an impressive 700+ pieces, to keep kids occupied for hours. It features retracting landing gear for playing on the ground or in the air. The box also includes a selection of minifigures including Captain Poe and a Resistance X-Wing pilot. The figures even come with a range of weapons and accessories, to give hours of fun, imaginative play. The model is a good size for playing with – it is around 14 inches long and 1 ft. wide with the wings open. The X-Wing Fighter includes lots of moving parts for added fun. The wings can be opened, and so can the cockpit which has a seat for a minifigure inside. Inside, there is a rack to store the weapons, missiles, and ammo. There’s even an access ladder to help the figures to climb aboard. This collection of minifigures is the perfect addition to any Star Wars collection. It features a range of characters from the new films, as well as familiar favorites. Each character comes with their weapons, so your child can re-create their favorite battle scenes. 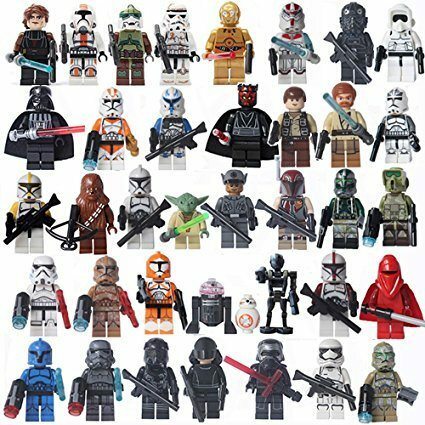 Each minifigure measures just over 1.5 inches tall, and there are nearly 40 included in the set. Children will have so much fun with this collection – they will never run out of ideas. The figures are great for encouraging imaginative play. They’re also great for children to play together – there are so many different figures there’s unlikely to be any arguing! This Star Wars figure building fit would make the perfect present for any child who loves Chewbacca! The suggested age range is from 8-14, and the pack contains over 175 pieces. The Chewbacca figure is highly detailed, with his signature furry design, a removable ammo belt and a spring-loaded weapon just like in the movie. The LEGO figure is fully poseable – the limbs can be moved into any position to create realistic battle scenes! It is almost 1 ft. tall, meaning it looks great on display, too. Once built, the Chewbacca LEGO figure is strong and sturdy – great for intense action play! If your child prefers other characters, there is a range of buildable figures so you’re sure to find their favorite. This new LEGO Star Wars kit is perfect for older children over 10 years old. It features over 1100 pieces, sure to keep kids busy and entertained for hours. BB-8 features many realistic details including a rotating head and a hatch which opens. The BB-8 figure stands over 9 inches tall and comes with a display stand so he can proudly sit in your child’s room. The stand also includes an information plaque which can be sat beside BB-8 and a minifigure version which can be used with other LEGO playsets. The Last Jedi LEGO model features a welding torch just like in the movie, which can be accessed via the opening hatch. Therefore, the figure is good for either playing with or for putting on display. The Star Wars Episode VIII LEGO playset is great for older children. It features nearly 1400 pieces, making it a fun and challenging build. It also comes with a selection of 5 mini-figures along with their various weapons. Each figure features realistic detailing sure to be popular with young Star Wars fans. The LEGO model is great for play or display. It features a handle which can be turned to fire the shooter, which can be aimed, on the top. The legs of the heavy assault walker can be posed, as can the head. The cockpit also opens, allowing a minifigure captain to be placed inside, ready for battle! The model is a great size, at around 13 inches high and long – kids are sure to have loads of fun building and playing with this set. One of the best new LEGO Star Wars sets is Poe’s X-Wing Starfighter. It comes with a great selection of minifigures, weapons, and accessories to give children plenty of opportunities for fun and imaginative play. They will love building the challenging set, perhaps with help from siblings or parents. The Starfighter has loads of moving parts which make it even more fun to play with – kids will enjoy playing with this model for years and it will also look great on display when they are finished. Our favorite cheap LEGO Star Wars set is the Chewbacca buildable figure. The figure is great for playing with or for display, thanks to the large 12-inch size. The figure includes some accessories, such as a firing weapon and removable ammo storage. The Chewbacca model will be loved by kids of all ages, and even adults who are Star Wars fans will love to have this model proudly displayed on their desk!